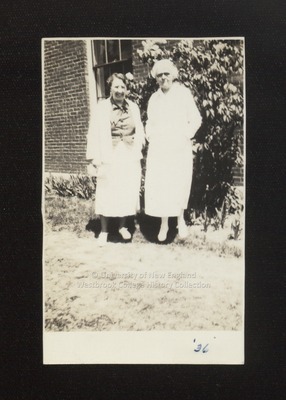 Dean Elsbeth Melville and "School Nurse" pose on the Westbrook Junior College campus in this sepia toned candid snapshot labeled '36 on the front. Dean Melville wears a light colored suit skirt and jacket with a dark colored blouse. Her hair is curly and wavy and comes just to her ears. She wears round frame-less glasses. On the back of the photo written in blue ink is: "Melville & School Nurse." Elsbeth Melville came to Westbrook Junior College as a teacher of Latin in 1928. She became a dean in 1936 and remained until 1945. She was so highly regarded that one of the student houses was later given her name. Elsbeth Melville was a 1925 graduate of Boston University's College of Arts & Sciences and longtime dean of women at BU following her tenure at Westbrook Junior College. Elsbeth Melville Percy was president of The College Club of Boston, the oldest women's college club in the United States.